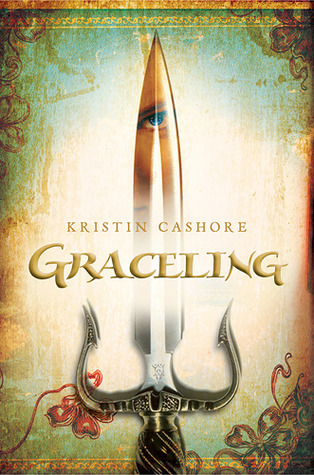 Summary (Courtesy of Goodreads): In a world where people born with an extreme skill—called a Grace—are feared and exploited, Katsa carries the burden of the skill even shedespises: the Grace of killing. She lives under the command of her uncle Randa, King of the Middluns, and is expected to execute his dirty work, punishing and torturing anyone who displeases him. When she first meets Prince Po, who is Graced with combat skills, Katsa has no hint of how her life is about to change. She never expects to become Po's friend. She never expects to learn a new truth about her own Grace—or about a terrible secret that lies hidden far away...a secret that could destroy all seven kingdoms with words alone. Another YA fantasy series. My summer reading list is becoming thoroughly predictable. I'm almost getting sick of this genre (but not quite yet) and will need to branch out soon. Anyway, this one's been on my reading list for a while because of all the hype around it. And I liked it, but I didn't love it. A solid three stars, but no more. So here's what I liked. Cashore's world was quite interesting. I really did like the concept of these graces, or special talents, and the way they were used and exploited by the various countries. I liked the political intrigue, and the story line was very engaging and well paced (except for that one part, when they were trudging through the cold and snow over the pass, and I just skimmed through it). I'm intrigued enough that I will probably be picking up the second book in this series just to see what Cashore does with a different set of characters. Because here's where we get to the part I didn't like: the characters. Specifically, the main character. I get that Katsa is supposed to be this strong female role model, the type of character girls can look up to. I get that it's supposed to be great that she's not needy and clingy and is not going to change who she is just because some boy happens to fall in love with her. I mean, I hate the Bellas and the Ewards as much as the next self-respecting independent-minded woman, and Katsa is NOT a Bella. BUT, here is where I'm going to get on my soapbox for just a minute, because Katsa is not a good role model for young girls either. So yes, it's great to be strong and independent, but you can be strong and independent and still be in a committed relationship. I had SERIOUS issues with Katsa's anit-marriage (and anti-motherhood) stance, because I firmly believe this is the wrong message to send young girls today. Sure, it's great to teach girls to wish for more than a ring on their finger, I for one whole-heartedly agree that there is more to life for women than being some man's trophy wife. But teaching girls that uncommitted sexual relationships are the new ideal is potentially more harmful for women in the long run, not to mention society. So maybe my issue isn't with Katsa so much as it's with the messages she stands for. Along those lines, I had some serious concerns with the portrayal of violence in this book. My issue isn't so much with the idea of a young teen girl killing people (The Hunger Games already broke me in to that idea), but with the physical fighting between Katsa and Po. So yes, it's cool that Katsa is physically stronger than Po. And it's very nice that Katsa is able to defend herself against all male predators so effectively. The message that girls should be strong and able to defend themselves against attackers was loud and clear. But Po was a good man that she genuinely liked (and *spoiler* came to love), so I found the amount of physical fighting between the two of them... bewildering. Cashore walked a fine line, and I'm not saying she crossed it at any point (she was very careful to show the amount of concern they took for each other's physical well-being, and the fact that Po never hit her outside of "training"), but I don't think it's ever a good idea to portray violence in a relationship as normal. Especially the one time their fighting episode turned *cough* amorous *cough*. That is just a bad association to teach young girls. Maybe others disagree, maybe I'm just old fashioned, but I did not like that aspect of their relationship (or really, any other aspect). So, after those two long paragraphs of griping, you might think I hated the book. But remember, I really did enjoy it for the most part. It was a nicely developed story, and I really am interested in reading the next book. My only beef is with the messages being sent to young girls, so I don't actually recommend this book to young adults. To anyone else who enjoys this genre, go for it.